Tomorrow's the big day. If anyone reading this still isn't familiar with Stitches West, it's a big knitting show that comes to town once a year and offers a slew of knitting classes and a gigantic yarn and accessory market. I'm still thinking about what to buy at the market ... I already have lots and lots of yarn at home, but indulging at Stitches is such a pleasure that I don't want to miss out on it just because I already have enough yarn to last until next year. This will be my fourth trip to Stitches. The first year that I went, I'd only been knitting for about a week, so everything was new and fresh and kind of mysterious. I went from booth to booth, touching every type of yarn, marveling at the possibilities. Finally, after hours and hours of looking, I bought a couple skeins of pink baby alpaca, which felt like butter in my hands. Being a newbie, I didn't know that you have to wind the skeins before you start knitting. So after a few weeks of trying to knit a garter stitch scarf, which was all I knew how to do at the time, the only thing I had to show for it was a big fat tangled knot of pink baby alpaca. A dear friend took it off my hands and later told me it took many episodes of Law & Order to untangle it. 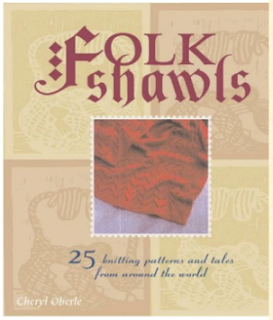 I skipped Stitches for a couple years, and when I returned in 2007, I had just read Cheryl Oberle's Folk Shawls and was in awe of both her and those gorgeous lace patterns. So who do I see not five minutes after arriving at Stitches? 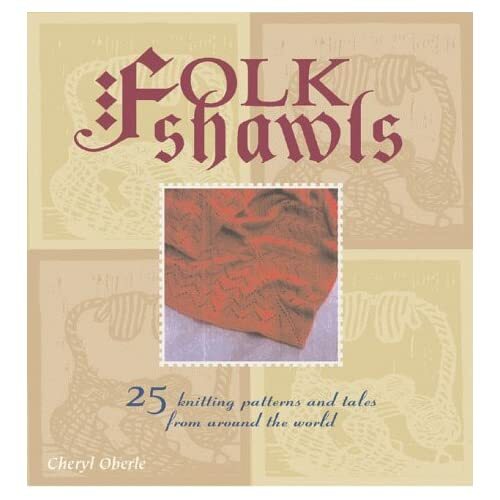 That's right, Cheryl Oberle, who is even more beautiful in person than she is in the pages of Folk Shawls. She was standing in her booth, talking to someone, and I shyly walked past her without stopping. But then a few minutes later I threw caution to the wind, walked back to her booth and told her I loved her book. She rewarded me with a big hug. Now, this was during a particularly difficult time in my life, and that hug was such a gift that it brought tears to my eyes. I skipped the alpaca that year and instead bought a skein of organic cotton yarn from Village Spinning & Weaving. Yes, I did wind it before knitting with it! I made a drop stitch scarf, but after it was done my perfectionist tendencies kicked in and I decided it looked too sloppy and frogged it. Sadly, that yarn is still waiting around for me to use it. Here it is with the little black kitty. My cats are becoming oddly cooperative yarn models. Last year at Stitches I bought several balls of the Katia Colibria that I mentioned in a previous post. I just love how it looks, like someone accidentally threw it in the dryer and it kind of fell apart but looks even more beautiful partially destroyed. So I'm not sure what I'll come home with this year. But I can't wait to find out.